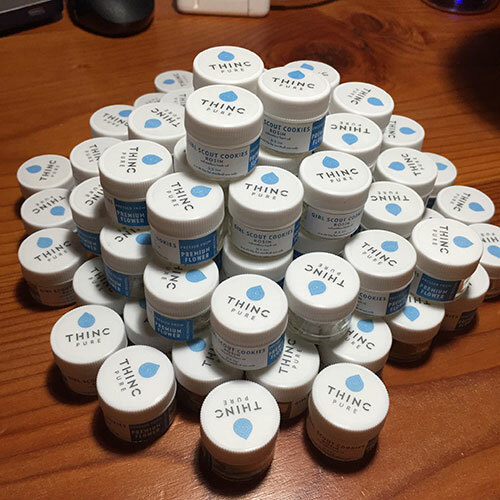 Thinc Pure appeared in Washington’s medical cannabis market in 2015 with a splash. Their CO2 extracted cartridges contain no adulterants like propylene glycol, vegetable glycerin or coconut oil. Few processors are able to extract at the correct viscosity for vape pen cartridges and choose to include those additives so their oils flow through the wick of the vape pen. Thinc Pure’s ability to make such deft extractions is due entirely to their widely experienced trio of extractors: Jeff, Sam, and Jerome — a.k.a. The Bearded Boys — who helped found Thinc Pure. Jump back to the Rosin explosion that began in February of 2015 when @Soilgrown Sal realized that putting a hard nug between the irons of a hair straightener would create a halo of perfectly dabbable oil around it. If you are unfamiliar with the birth of Rosin, be sure to listen to the Ganjapreneur podcast episode where we talk with Jeff Church aka @CannabisReverend, in which he explains how easily anyone with a hair straightener can make oil from flower. The idea that oil could be extracted with nothing but mechanical pressure shook the BHO market as suddenly dabbers could make their own oil and not even have to think about soupy dabs with residual butane. Thinc Pure was there from day one following and commenting on the Soilgrown’s Instagram feed and spreading the news about rosin at the Spring 2015 Spannabis in Barcelona, Spain, where Thinc Pure’s founders turned a wide range of cannabis celebrities onto the technique, including Marc Emery, Matt from House of the Great Gardener, and cannabis activist Todd McCormick. Thinc’s love of the oil’s consistency and on-point terpenes motivated them to release their own line of packaged rosin oil. Thinc Pure’s rosin is for connoisseurs who want to enjoy clean oil with full flavor but don’t want to put in the labor of squeezing it up. Cannabis enthusiasts can be sure the rosin is free of molds and other microbials because Thinc uses microbe-killing UV light on all their plant material before they process it. Rosin offered by Thinc Pure, made from premium Girl Scout Cookies cannabis flower. We had the opportunity to try their Girl Scout Cookies Rosin and were very impressed. As soon as you remove the cap, the terps drift out and cause you to take notice. On this run the GSC Rosin smelled very pleasingly of pineapple, coffee, chocolate and skunk. The consistency is soft and sticky so it grabs the dab tool and does not crack and fly across the room as sometimes happens with shatter. Rosin is a great reason for using an e-nail so that you don’t get too hot of a dab and ruin the terpene profile. The high was experienced by us as similar to Girl Scout Cookies flowers but more-so and faster, which is exactly the reliability we want. Testing at 67.5% THC, we were elated and happy and did not experience a racing heart. It came on smoothly and grooved with us there like an old friend. You can purchase Thinc Pure rosin at these locations.